Born in 1916, Ge Yang was a first-generation revolutionary. She joined the then underground Communist Party when she was only a teenager in the 1930s and participated in the anti-Japanese and later civil wars. From the 1940s, she settled into working with the press and news agencies in the army and later in the New China news agency. Like many liberal minded intellectuals within the Party, Ge Yang became a "rightist" in the 1950s and was expelled from the Party for the first time in the 1950s. She spent more than 20 years in physical labor to "reform" her thoughts. 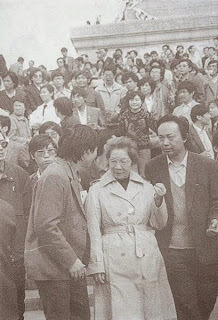 It was only in 1978 that she was able to return to a normal life with Deng Xiaoping's new regime. She became the editor-in-chief of a newly reemerged magazine New Observer, which instantly became a strong voice of liberal thoughts. In 1989, after the death of Hu Yaobang, Ge Yang organized a large-scale symposium of more than 50 prominent intellectuals. The theme of the meeting became an appeal to correct the injustice imposed to Hu Yaobang and victims of recent ideological struggles. When its proceedings were carried in the World Economic Herald, the newspaper was promptly closed and its chief editor fired. After Zhao Ziyang delivered the eulogy for Hu Yaobang, we filed past to pay our last respects. As we walked by the glass doors of the Great Hall of People, many lingered for a moment to observe the many thousands of students sitting outside on the Square. Rows of soldiers stood with arms linked to separate the students from us. I felt rage as I stood there silently watching them. The atmosphere was tense. Some of the officials feared that the students might try to force their way into the Great Hall. A soldier came over and asked me politely to move on. "The soldier listened and then left. In the middle is a wall of brutal force. That side is the sea of true feelings. Yaobang's soul is over there. There would not have been this side if not for the other side. Ge Yang at Tiananmen Square on May 14, 1989. Later, Ge Yang left Beijing to attend a meeting in America. After martial law was imposed in Beijing, the then already 73 year old woman decided to stay in the US, thus began her life in exile. After the massacre, she publicly declared her withdraw from the Party: "The Communist Party we had joined years ago was not the Party of today. I must completely break from this Party that suppressed her own people." 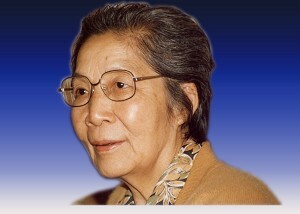 In her old age, Ge Yang lived on feeble incomes from her writing and supports from friends and charity. In 2002, she met the famous scholar Sima Lu (司马璐) and discovered that they had known each other years ago when they were young. (Both of them had changed their names since the war period.) They married each other. Ge Yang died in New York City on January 18, 2009. She was 93. Hi may I have some links to the websites or sources that you have used to make this blog about Ge Yang? Thanks. Please contact me by email (eddie@eddiecheng.net) for what you need. Thanks.